Purple iris flowers grow along the banks of Jack's Pond which is located in Western Brook Pond in Newfoundland Labrador, Canada. 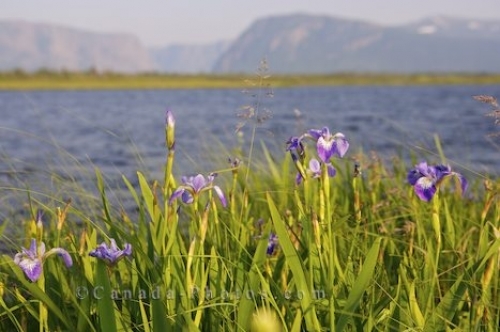 Iris flowers thrive to their fullest along lakes shores or in wet fields and these ones love their homes along a trail to Western Brook Pond in Western Newfoundland, Canada. These flowers add to beautiful scenery of Western Brook Pond and can be seen from the boat dock at Jack's Pond. Iris flowers lining the trail to the Western Brook Pond boat dock alongside Jack's Pond, Gros Morne National Park, UNESCO World Heritage Site, Viking Trail, Trails to the Vikings, Highway 430, Northern Peninsula, Great Northern Peninsula, Newfoundland Labrador, Newfoundland, Canada. Picture of iris flowers adorning the shoreline along a trail to Western Brook Pond in Newfoundland Labrador, Canada.